INDIANAPOLIS, February 10, 2013 -- Global Water Technologies (OTC Pink: GWTR) notes efforts to support a water technology initiative with a living laboratory in Indianapolis took a significant step forward this month with meetings among local, state and federal officials. Global Water Technologies hosted a meeting with the U.S. Environmental Protection Agency (EPA) and Small Business Administration (SBA) to discuss innovation in the sector as part of Confluence, a water technology cluster formed by the two federal agencies in 2011 to facilitate regional efforts supporting research and economic development. The discussion also included representatives from the Indiana Department of Environmental Management (IDEM) and Indiana Economic Development Corporation (IEDC) at the state level and Indianapolis city and neighborhood leaders. Global Water Technologies is working to introduce several innovative components of a smart water grid that include a consumer dashboard that educates and motivates consumers to use water efficiently; advanced two-way metering solutions that provide better tracking of usage; and a system using sensors and software to identify problem areas caused by hidden underground leaks in the network of pipes that deliver drinking water. The company is working with local partners to deploy, test, research and refine such solutions in a living laboratory located in a neighborhood just north of the Indiana University Purdue University at Indianapolis (IUPUI) campus. The unique approach seeks to provide a real-world environment for developing local solutions that can be exported across the city, state and country. 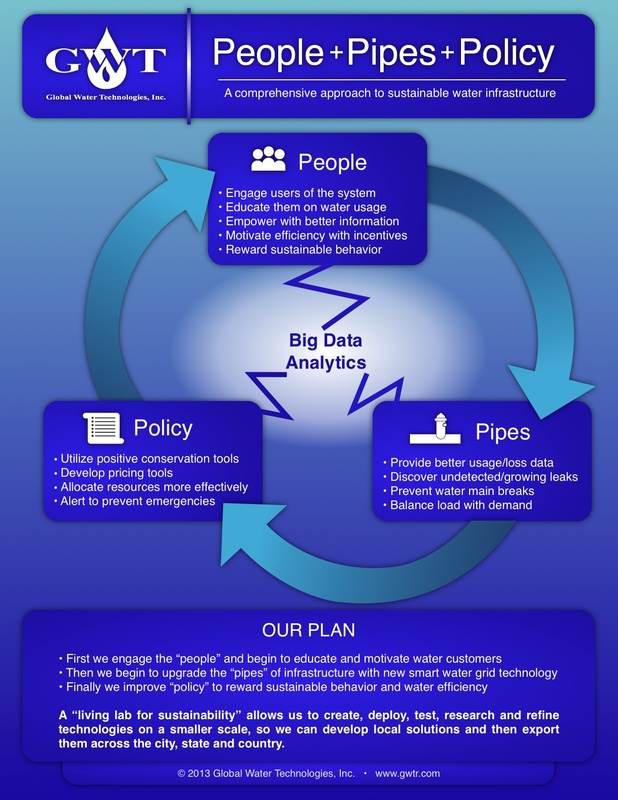 Using a comprehensive approach that connects people + pipes + policy with big data analytics, the effort begins by engaging the people who use the system to educate, motivate and reward sustainable water use. That data is collected and processed using information technology and infrastructure tools to better monitor water flowing through the system. As a result, policies can be developed and refined to encourage water conservation, improved pricing models and more efficient asset management. The living laboratory in Indianapolis is part of an emerging focus on new water technologies that is getting national attention, especially in the Great Lakes region. Wisconsin, Illinois, Indiana and Ohio have a wide range of resources that include federal research institutions, leading universities, innovative utilities and private sector strength among both established and emerging companies. In an era of limited budgets and growing demands for fresh, clean water, new technology solutions are key to improving efficiency and reducing overall costs to communities. While such solutions can improve many aspects of water management, a primary opportunity is reducing the loss of valuable drinking water. Advances in sensors, software and analytics are creating significant financial incentives for new water technologies. Support for innovative water technology solutions is needed at all levels, since water issues are usually local and regulated by state and federal policies. One exciting idea to spur innovation in water technologies at the federal level is the possibility of creating ARPA-W, which could be modeled after the Defense Advanced Research Projects Agency (DARPA) and the Advanced Research Projects Agency for Energy (ARPA-E). Encouraging similar transformational and creative thinking for water innovation could spur research and development efforts that have major benefits for the United States. Global Water Technologies will be addressing such opportunities at Water 2.0, a Water Innovations Alliance conference at 30 Rockefeller Center in New York City on February 26.